It’s time once again for me to preach to the masses on the greatness of boardgaming. Nothing beats the social aspect of in-person gaming with friends. Last year’s run-down remains a great list of recommended games. Here again are some great examples of boardgames to get you and your family gaming. You might not find all these titles at your local mega-mart but many can be found online or in a friendly local game store. Some may argue $50+ boardgames are expensive, but compare that to videogaming (and where multiple copies are required for multiplayer play) and the economics of boardgaming shows their true value. Good boardgames are timeless, just as good today as they will be years in the future. They will provide many more hours of entertainment than most video games. In that vein, feel free to delve into some past year’s guides for 2014, 2013, or 2012. For each game I’ve provided the number of players, an approximate MSRP (you might find it lower), and expected time for one game. Games suitable for kids old enough to sit still and play, but contain enough interesting activity to entertain adults. Every once in a while, I come across a great kid’s game that I could conceivably plunk down in front of a bunch of grown-up gamers and we can all enjoy a quick game “filler” at the start or end of a night of gaming. The Heroes of Kaskaria has simple rules so that any age player could win, but it also provides players with interesting choices such that a strategic player will have a better chance of success. The idea is for players to participate in two simultaneous races. The faster moving Cliff Runners approach the peak from one side and the Scaled Griffons from the other. Players either pick up two cards or play a set of cards of matching color (but not both draw and play.) Cards either grant points (in the form of gems), two additional cards, or move one’s animals (runner or griffon) closer to the peak. There are more runner cards than griffon cards, but the griffon route to the top is shorter. When one animal (runner OR griffon) reaches the peak, the game ends and bonus points are awarded for the 1st, 2nd, and 3rd place of both runner and griffon. The player with the most points (from animals and previous cards) is declared the winner. The board and pieces are great and draw the young folks into the game. The interesting decisions come when players decide whether to play their cards now (and move forward on the race) or draw more cards and hope to play more matching cards at once. (For grown-ups, I highly recommend using the optional rules that reward players for playing multiple cards of the same color and type.) Some kid boardgames float into and out of my collection, but I expect The Heroes of Kaskaria to stay around on a permanent basis. The original Ticket to Ride game is my go-to game whenever a friend asks me to recommend a game for their family. Similar to the familiar card game Rummy, players collect sets of colored cards. They then use these colored sets to place trains down on a central board, scoring points based on the length of the link. Players attempt to place their trains to connect up cities that match those shown on their “ticket” cards to earn bonus points depending on the distance between the cities. The simple rules combine to make an interesting game for grown-ups that is still accessible by the younger set. With Ticket to Ride: First Journey, the franchise has been simplified even further. Players still collect sets and place trains to fulfill connections on their held ticket cards, but there is no ongoing point total. Placed trains score no points and the winner is simply the player to fulfill six tickets. In First Journey, players must still balance drawing vs playing cards and there is some urgency in taking control of the choicest routes on the board. However, the board is friendlier overall (fewer chances to block out opponents.) Cities on the board are also designated by pictures rather than words, so Ticket to Ride: First Journey is even playable by pre-readers. 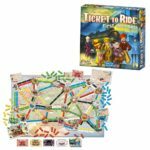 Kids will eventually grow out of it, but it makes a great introduction to the Ticket to Ride franchise. A few games of First Journey can serve as a boost to help younger players with the transition to the basic game. As your family gets older, they’ll have more fun with games with a bit more “punch”. Games in this category are playable by most any age level (so even the young ones can participate) but have enough strategy so that the older players have a chance to use strategy to increase their chances of winning. The favorite game of the year at my house remains Ice Cool. It is the great independent-publisher success of the year. Kids (and many adults) love dexterity games because it typically comes down to technique (as opposed to strategy) and possibly a little luck. In Ice Cool, players are penguins playing hooky at penguin school. One player is the hall monitor and chases the other players around while they try to move through the school. Players gain points from passing through specific doorways while the hall monitor scores points for making contact with the other penguins. Most “flicking” games (where player flick things around a board) are large, expensive things that are not portable. The magic of Ice Cool lies in its game board built out of nested boxes that are then joined together to make a large play area. The penguin pieces are rounded and bottom-heavy, which gives them entertaining trajectories. With a bit of precision they can be hit to curve to the right or left. If you are really good (I am not) you can even hit their top and make them hop upward entirely over a wall. The game plays very fast, has a bit of chaos, and is simply a hoot. Since the whole contraption packs up into a standard boardgame box, it is my go-to dexterity game if luggage space is at a premium. I can’t let a year go by without a recommendation for a cooperative game, and Star Trek Panic hits the spot. Yes, it is a franchise rebranding of the game Castle Panic, but it does such a good job adjusting to the Star Trek theme, it stands great on its own. In the game, players coordinate to fend off enemy ships as they attack and engage the Enterprise. The ship has six different shields, each facing a different section on the board. Enemy ships appear in a section on the edge of the board and fire on the ship while flying progressively closer and closer. Players use their cards to shoot down the enemy, repair damaged shields, or even rotate the ship to put a new shield facing into the line of fire. However, all this is just stalling for time because there are also “mission” cards requiring a player’s precious cards. Spending cards exclusively to fight off incoming attacks is a losing proposition, because the game can only be one by completing a set number of missions. As with all cooperative games, they scale well among various levels of play since players are free to discuss options together and give each other advice. It is also fun for the family to all win or lose together. A solid game, paired with a popular franchise, Star Trek Panic easily makes the holiday list. These are great games for most families – or a group of adults looking for a medium-weight game to play casually around the table to end an evening. These are a notch up in complexity kid’s or party games, but are simple enough for teens or preteens to enjoy. In Colony, players roll and draft dice to buy and upgrade buildings in order to roll more dice, change the face of the dice they roll, score victory points, or any combination of the three. The game includes stable (white) dice and unstable (grey) dice. Unused stable dice can be kept for later use, but grey dice disappear at the end of a turn. On one’s turn, a player rolls three stable dice and chooses one to keep. Each other player can then “draft” one of the remaining dice for use on their turns. The active player then rolls any extra dice they may have (from their various powers purchased earlier in the game) adding those to their available pool, perhaps changing them with powers from cards they own. New powers (from new cards or card upgrades) are obtained by spending dice on new power cards or upgrading cards already owned (players start with 4 cards.) There is a great catch-up mechanism where a player can discard a power card and gain a benefit depending on how far behind they are from the leader. I also love how there are multiple paths to victory (roll lots of dice, manipulate dice freely, or some combination of the two.) The game comes with a large number of card types and only a few are used in any one game, so the game can be played over and over again and still provide players something new to consider. A far cry from the fairly random family classic The Game of Life, Pursuit of Happiness challenges players to manage their resources (time, money, knowledge, creativity, and influence) in order to have the “most successful” life experience. The game is played over several rounds, starting as a teen (you aren’t allowed a job or relationship) and ending in old age (where you can’t do overtime and aren’t able to do as many things due to poorer health.) Pursuit of Happiness is a worker-placement game where, each round, players take turns placing their hourglasses (representing spent time) on locations on the board representing different activities. A few options simply provide resources while others allow players to purchase items, start activities (like a hobby), start a career, or even start a relationship. Some of these are one-shot things but many are able to be upgraded over multiple rounds to provide further benefits. Some, like jobs and relationships, have an “upkeep” that must be spent each round in order to receive their ongoing benefits. The game is a nice balance of maintaining one’s current needs while also planning longer-term payoffs. Players all start with a unique starting point and a unique ability that can be used during the game. The game is a solid worker-placement game where one needs to manage the resources at hand, but I find the excellent theme to make it into a great little game. The more, the merrier! Here are a few games that can accommodate at least 6 players and, unlike some games, tend to be more fun with more players. The craziest game I played all year was my single game of Captain Sonar at the GenCon convention. Two teams of players face off as submarine crews in an effort to sink their opponents. Each player on a team has a unique role to play. The captain organizes everyone and drives the boat (they have to announce their movement but not their location), another player plays a form of “battleship” trying to track the enemy ship, a third player manages the ship’s energy supply (calling out when the sub needs to stop for repairs), and a fourth manages the loading and firing of weapons. Played either turn based (alternatichess.ng turns) or real time simultaneous (the way REAL submariners would play) the game is a hilarious rush of adrenaline arising from a situation akin to multiplayer offensive juggling while playing chess. After releasing to great reviews, it has been extremely hard to find a copy. I’m lead to understand a new production run has recently been released and it may now be found again in stores. If your idea of a trivia game is waiting around while other people spout off details of things that only vaguely remain in your memory, your trivia gaming is woefully uninformed. 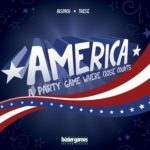 America is a trivia game around American History, but like the previous games Fauna and Terra (representing animals and geography) players don’t have to know the right answers, they just need to be close. A question is presented (such as “In which year was Close Encounters first in theaters?”, “Which state gets the most snow each year?” or “How many albums has Madonna sold?” and then players place their bets on the game board. Once all bets are placed, players score points for correct answers as well as (fewer) points if they are close to the right number. Guess correct (or almost correct) and you get your betting token back, but wrong guesses cause you to lose your token. (You get a token back each round.) The game even tries to be helpful by indicating any questions about states as lying on the east or west of the Mississippi. By awarding points for guesses and hunches, America provides a trivia game experience that is accessible to a much wider audience. 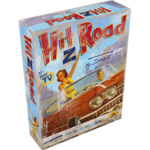 These are games for the more serious boardgamer. These have a few more rules and take a bit longer to play. However, they can be the most satisfying games to play for those willing to spend the time sitting at the table. While there are still quite a few games for me to check out, I haven’t found many new games this year that caught my fancy. Here are a couple that are new-ish ones that I can highly recommend. The price point may scare you, but they will provide many hours of enjoyment and can often be found at a bit of a discount. Star Trek: Ascendancy is a wargame like Risk or Axis and Allies but also includes exploration and economic development. Three races (Federation, Klingon, and Romulan,) have their own strength and weaknesses. Starting on a home planet, players link to new planets by “swinging” the “arm” of a space lane around the board to configure it however they want, making a very interesting setup where the adjacency of planets is heavily determined by player decisions. Players colonize and develop worlds to gain resources: Culture, Production, Research. Production uilds a resource node. Production is used for constructing just about everything (ships, resource nodes.) Research is used to improve one’s abilities such as ship offense or defense to help during combat. Culture is used to colonize new planets, “peacefully” take over occupied planets, and can be cashed in for Ascendancy tokens. Collect 5 Ascendancy to win a cultural victory (vs a military victory of occupying all opponents’ home planets.) Acendancy is not a simple game like Risk, but the extra effort to learn the rules pays off in a dividend of a fun Star Trek style romp through the galaxy. It is long, and has many rules but they “make sense” so that new players can quickly get up to speed. There are also several options to speed up the game, such as starting with some technology and/or resources or simply requiring less culture to reach Ascendancy. Currently, the game can only be played with 3 players (one per each starting race) but expansions coming out later this fall add in new races (Cardassian and Ferengi) which would allow more players to play (with an appropriate lengthening of the game.) It is not easy to construct a game of this type that plays quickly and yet contains all the elements that make the genre popular. Star Trek Ascendancy does a good job of balancing military vs cultural/economic victories, allowing players to pursue the path to victory that they prefer. Players willing to put the requisite time into playing the game will find a very satisfying and (Star Trek) thematic game of galactic proportions. Got a bit of space left in the toe of your sock over the fireplace? Here’s a couple of great small games that come with a small price to boot. Dalek Dice is a simple push your luck dice rolling game with a Doctor Who theme. You play as the Daleks and roll dice to display humans, Daleks, the Exterminate side, or a TARDIS representing the Doctor. The goal is to roll at least as many Daleks as humans, scoring points for each conquered human. Each time the dice are rolled, if any Doctor (TARDIS) or Exterminate faces are rolled, one (of each if both are present) are set aside. Standard Dalek and human die faces can be set aside if a player wishes. Leftover dice are rerolled and the process is repeated (set aside a Doctor die and an Exterminate die if one appears.) If three Doctors are rolled (over 3 rounds) the player’s turn ends immediately with a score of zero. If a player stops before this happens AND they have rolled more Daleks than humans, they score points for each human (plus 5 points if all the dice are used.) However, if three Exterminates are rolled (over the course of 3 or more rounds) the turn ends in immediate victory and the player scores double points for any humans captured. Dalek Dice is a very quick game, suitable for carrying around for a quick game before dinner at a restaurant or casual play while waiting for your friends to show up at game night. Despite the simple rules, the theme does shine through and it is always nice to play as the “bad guys.” Just be sure you’re in a place where it is acceptable to shout “EXTERMINATE” over and over in your best Dalek impression. Some games fall into a category uniquely their own. In Stellar Conflict players choose a set of ship cards out of four possible decks (representing alien races) and then have anywhere from 30 seconds to 2 minutes (depending on the agreed size of the decks) to slap their ships down onto the board. At the end of the time limit, everything freezes and ship battle is resolved. Each ship card has a priority number and they are resolved from lowest (typically weaker) ships to highest number. Ship cards display beams of lasers worth one, two, or three damage and rubber bands are provided so players can accurately measure the directions shot. Ships are removed as soon as their damage exceeds their health level. This often results in unexpected consequences as intended targets disappear (or just poor planning) causes later ships to fire upon their own fleet. Some ships have special attributes such as red lines on parts of their border representing impenetrable shields. Each of the four races have ships with signature abilities such as shield penetrating lasers, ships that fire in two separate rounds, ships that are “free” to add to one’s deck, or beams that slow down other ships (add to their priority number so they fire later.) In addition to a simple ship to ship battle, players start the game with a freighter filled with cargo cubes. Damage to an opponent’s freighter will transfer the cargo to one’s own ship and are worth points at the end of the game if that ship survives. Points are also gained for destroyed enemy ships (but not for one’s own surviving ships.) Since the “play” part of the game goes so fast (two minutes or less), most of the time is taken up by resolving the battle. Priority numbers are prominently displayed and (perhaps with the help of included rubber bands for tracing lines of sight) combat resolution is typically straightforward. Even though no one is making decisions anymore, the combat resolution phase has plenty of ups and downs as players see their best laid plans go up in smoke by ships being eliminated in unexpected ways, resulting in plenty of self-inflicted wounds. As mentioned, the game is extremely quick with short games played in 30 seconds of frantic action followed by a few minutes of resolution. Even long games (two whole minutes) are resolved in 10 minutes or less (and the ups and downs of battle keep everyone on their toes.) I have not tried a 4 player game with a full complement of ships and I suspect that might run a bit long on resolution (still 120 seconds of game-play!) but that would still be a solid entry in the “filler” (short games for the start or end of an evening) category. With four races (each with special powers,) the option to build custom decks (when playing 30 or 60 second games,) and the inclusion of several game options (asteroids and speed of play) this small box holds a great deal of gaming fun. Role Playing Games have surged in popularity in the past couple of years. If someone in your life shows a leaning towards imagination, creativity, or storytelling, an introduction to the world of role playing games might be in order. Here are a few examples spanning a wide variety of types and recommended ages. Volo’s Guide to Monsters is the latest supplement for the Dungeons and Dragons line of role playing games. Rather than a simple listing of monsters and statistics, the book really dives in to the monsters presented, giving extended backgrounds for many of the more important monsters in the setting (gnolls, orcs, goblins, etc…) Written with a tongue-in-cheek style for Volo (explorer “extraordinaire”) with a counterpoint by Elminster (the famous mage) the game is elegantly furnished with art and story elements sure to inspire any player or game master to new creative heights. Whether it is a Dungeon Master adding new enemies to their game, or players looking to play a new “monstrous” race, Volo’s Guide to Monsters has a bit of something for anyone, even those just looking for some great D&D themed reading material. Fantasy Flight Games produces a Star Wars RPG. The basic set comes in four flavors: The Force and Destiny (Jedi stuff), Edge of the Empire (smuggler/bounty hunter stuff), and Age of Rebellion (rebels against the Empire stuff.) The three books can be interchanged and combined, with only a few thematic differences. The RPG has strong story elements and utilizes a custom set of dice that are used to resolve combat and other challenges with a single roll. I highly recommend the Beginner Box version of the rules that serve as an introduction to the RPG rules. Each box (there is one for each of the three main settings) contains a few pre-made characters, the custom dice, an adventure map, and a short written adventure that introduces the rules little by little as players move from encounter to encounter. (A second adventure and more example characters can be found on the Fantasy Flight Games web site.) Included in the box are some typical monsters/enemies and rules for players to play the game for several more (self-created) adventures if they so choose. The full rules for the Star Wars RPG comes in a rather pricey hardcover (and doesn’t include any dice) so one of these Beginner Game boxes is a great deal as an introduction to the game. In honor of last year’s movie, there is also a Force Awakens Beginner Game with the same sort of contents, but the adventure and information is set just prior to The Force Awakens movie. These Beginner Games are a great intro this RPG setting as well as RPGs in general. No matter what toys and presents the holidays bring, be sure to keep time in your schedule for playing with friends and family. While the games here come highly recommended to provide fun for a wide range of players, there are plenty other choices available. Ask your local game store, a boardgaming friend, or check some of our past recommendations.